O’Toole’s performance against Japan – the number one team ranked in the world at the time – was nothing short of amazing! The result on 7/7/17 on ESPN2 was USA 5, Japan 0. Just to put this into perspective in case you didn’t see the game O’Toole, along with USA’s stunning defense allowed only one hit against a lineup consisting of some of the smartest hitters in the world. Not to mention, O’Toole was also pitching against some of the best coaching in the world, because I’m sure Japan’s coaches are clever and were making adjustments throughout the seven innings yet O’Toole and the USA coaching staff managed to keep Japan’s hitters entirely off balance, shutting them out. She is poised on the mound and graceful when she pitches. Her command of her spin and the strike zone is phenomenal. And her mechanics are certainly polished, to say the least. It’s easy to tell why O’Toole is a favorite softball pitcher here at fastpitcher.com. Indeed, it was a pleasure to watch O’Toole and our great USA softball team on a national stage thanks to the World Cup and ESPN. These softball players are amazing athletes! Athletes in men’s sports (i.e. Baseball) comparable to these women’s abilities I’d imagine are getting millions of dollars in signing bonuses alone. 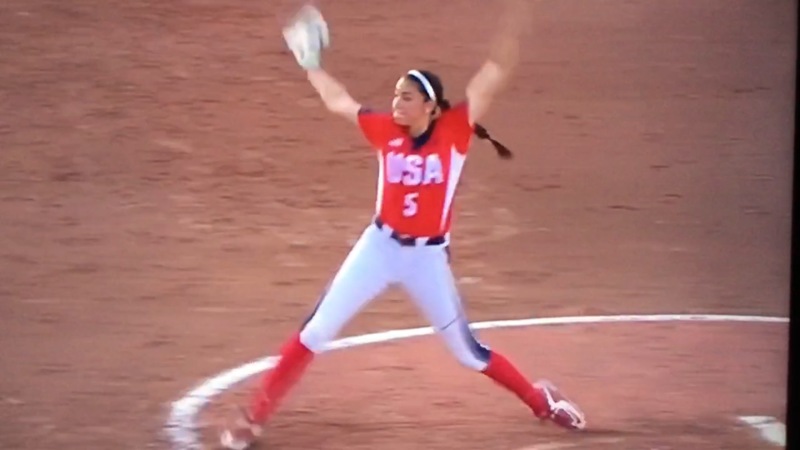 Pay-scale aside, it’s really a shame that we can’t at least watch and enjoy these Fastpitch performances and talented athletes more often on a national televised stage outside of the World Cup. How long is it going to take National Pro Fastpitch to get their games televised nationally by the likes of ABC, NBC, ESPN, etc. so we can all enjoy the games throughout the summer, ongoing? 1.72 million WCWS viewers can’t be wrong! Here’s to hoping it’s soon.